Inspirational saint: Josephite Sister Marie Dowling believes St Mary of the Cross MacKillop’s path to sainthood was seen in her unhappy family life. Photo: Emilie Ng. FAMILIES struggling to put food on the table could find hope from the life of Australia’s first saint, St Mary of the Cross. While the Fitzroy-born saint is well known for her battles against the hierarchical Church, Josephite Sister Marie Dowling believes the path to sainthood was seen in her unhappy family life. At 16, Mary MacKillop took up the task to be the primary carer for her seven siblings, five of whom died by the time the Josephite founder was 44. Her father Alexander MacKillop was a scholar and had studied in the seminary in Rome but “wasn’t a good provider” and failed in his business endeavours. The burden was clear in a letter Mary wrote in 1873: “My life as a child was one of sorrow, my home when I had it a most unhappy one”. These words written by Australia’s first saint and the Brisbane archdicoese’s patron appear on a memorial window display at Penola Place in the St Stephen’s Cathedral precinct. 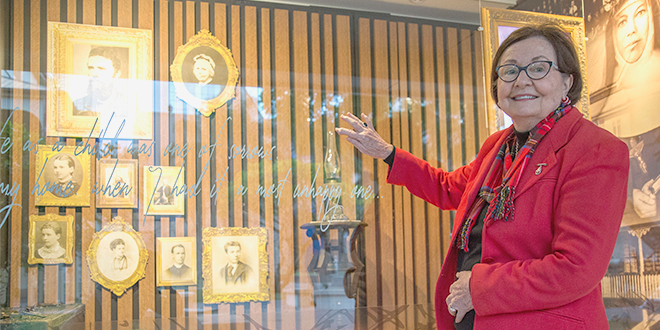 The display runs across two windows, the first showing Mary MacKillop’s family and the other featuring a painting by Coolum artist and Archibald Packing Room Prize winner Jan Williamson. The painting was commissioned for St Mary of the Cross’ beatification in Rome in 1995 and is on loan by the Marist Brothers. The window memorial is part of the Mary MacKillop Walk, blessed and opened by Archbishop Mark Coleridge on August 8, 2015, the feast of St Mary of the Cross and the 150th anniversary since the founding of the Josephites. The walk leads to St Stephen’s Cathedral and follows the footsteps of St Mary of the Cross, who once walked the streets of Brisbane. The window display was organised by Sr Dowling, who co-ordinated the Mary MacKillop Place chapel for six years around the time of St Mary of the Cross’ canonisation, and Liturgy Brisbane director Fr Tom Elich. Sr Dowling said the window display would provide hope for families who, in today’s society, are experiencing the same struggles as Australia’s first saint. The window into the family life of St Mary of the Cross MacKillop will be on display for the next 12 months.